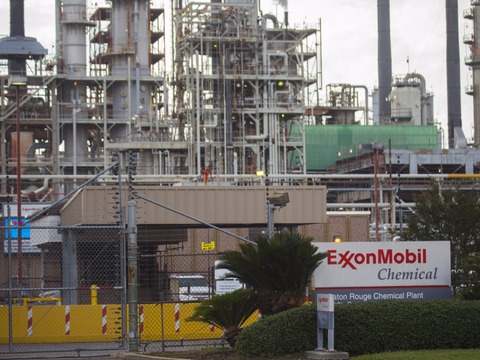 A view of the Exxonmobil Baton Rouge Chemical Plant in Baton Rouge, Louisiana, U.S. on November 6, 2015. U.S. refineries are producing more fuel than ever as they seek to meet rising demand - from overseas, rather than the drivers on nearby roadways. Last year, the U.S. became the world's top net exporter of fuel, an outgrowth of booming domestic production since the shale oil revolution started in 2010. That's a fundamental shift from the traditional U.S. role in global markets as a top importer and consumer. Net exports are on track to hit another record in 2017, making foreign fuel markets increasingly important for the future growth prospects and profit margins of U.S. refiners. Shale oil producers have provided refiners with abundant and cheap domestic crude supplies, giving them the raw material they need to produce internationally competitive fuel. The nation set a record in 2016 by sending a net 2.5 million barrels per day (bpd) of petroleum products to foreign markets. That compares to net fuel imports of 2.3 million just a decade ago, according to U.S. government data. Booming exports have bolstered margins at the biggest U.S. refiners - including Marathon Petroleum and Valero - and compensated for lack of strong growth this year in U.S. fuel demand. Now, the government of U.S. President Donald Trump is seeking to deregulate oil and gas production to further leverage rising U.S. exports for international political gain - a policy Trump calls "energy dominance". Surging U.S. crude production has already complicated the ongoing effort by the Organization of the Petroleum Exporting Countries (OPEC) to tame a global glut that has halved oil prices since 2014. The United States remains a massive importer of crude oil - regularly trading the top spot with China - but American refineries now re-export much of that oil as jet fuel, diesel and gasoline. The U.S. has a growing role in satisfying demand for motor fuel in countries such as Mexico and Brazil, where the thirst for U.S. fuel is likely to accelerate amid refinery outages and high production costs. Refined U.S. exports are also going further afield to Asia, and diesel exports to Europe increased in June to levels not seen in nearly two years, traders have said. Traditionally, oil traders, refiners and investors have considered U.S. fuel demand as one of the leading metrics for predicting international crude oil supply and price trends. Now, they are increasingly looking to foreign demand for U.S. fuel for guidance. "Globally, you're going to have increased demand for all of our products, and so our focus will go beyond the U.S. borders," said Texas-based Valero's Chief Executive, Joe Gorder. In contrast, he predicted a "slight decline" in U.S. gasoline demand over the next decade. U.S. gasoline demand hit a record in 2016, as low pump prices encouraged consumption, but has leveled off this year. Rising fuel efficiency in cars is expected to limit future domestic demand growth. U.S. refined products are filling shortages in countries such as Mexico and Venezuela, where refineries have been running below capacity. U.S. exports have also made inroads into Brazil's market by undercutting the price of locally produced fuel. Latin America's imports of U.S. fuels reached almost 2.5 million bpd in the first quarter compared with 2.32 million bpd in 2016. The growth was fueled by Mexico, Brazil, Peru, Venezuela and Central America, according to the U.S. Energy Information Administration (EIA). Mexico - already the biggest export market for U.S. gasoline and diesel - is seeking higher-than-usual volumes in July and August to fill a void left by a fire at its biggest refinery last month. In recession-scarred Venezuela, the country's largest refining complex has lowered operating rates this month to less than half of its 955,000-barrel-per-day capacity, a level that has required state-run oil company PDVSA to import more fuel to meet domestic demand. Between them, Mexico and Venezuela have recently said they want to buy extra volumes of almost 19 million barrels in the second half of the year - mostly from the United States - an amount suggesting that U.S. exports will grow again this year over last year's record levels. Net U.S. exports of transport fuels could rise 8.8 percent this year, according to PIRA Energy, an analytics and forecasting unit of S&P Global Platts. In Brazil, fuel distributors have begun buying more U.S. imports because they are cheaper than fuel sold by state-run oil firm Petrobras. Petrobras had failed to align its wholesale prices with international markets, opening a window for importers to bring fuel into Brazil. Petrobras last month said it would peg its fuels more closely to international prices as it tried to slow the expansion of U.S. imports. Analysts said supply from U.S. refiners was unlikely to slow much. U.S. refiners have also boosted exports to Europe and Asia. In Europe, U.S. shipments of diesel rose to nearly 500,000 bpd in June, according to traders, well above flows that have rarely exceeded 370,000 bpd since July 2015. U.S. global distillate exports, including diesel, hit a record that month, said researcher ClipperData, which tracks global oil flows. Exports of refined products to several Asian countries, including India, Japan and South Korea, rose to record levels in 2016, and China took a record 303,000 bpd of U.S. produced fuels in February. U.S. refiners are likely to play in important role in meeting rising demand from Asia, said Nicole Leonard, senior project consultant at Platts Analytics Oil & Gas Consulting. Demand for U.S. fuels is underpinned by refinery challenges in neighboring countries, said Sandy Fielden, director of oil and products research for Morningstar Commodities Research in Austin, Texas. "It doesn't seem that these Latin American countries are going to cure their refining problems overnight," he said.